Christie’s longstanding Chinese partner Wincomn Technology delivered stunning visuals using the Christie HS Series 1DLP laser projectors for an integrated multimedia show at Dongyi Culture Museum in Linyi City, Shandong Province. 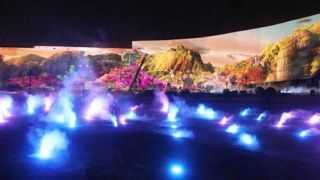 Touted as the first large-scale multimedia show in Shandong Province that incorporates projection, laser, fog, and audio effects, the projection portion of “Da Mei Yi Song” (Tribute to the Great and Beautiful Dongyi culture) is accomplished by more than 20 Christie D20WU-HS projectors displaying vivid and lifelike visuals on the outer walls of the museum. The visuals complemented the other multimedia elements to deliver an enchanting performance that accentuates the heritage of Dongyi culture, its origins dating back thousands of years. The museum is surrounded by three curved outer walls that have uneven surfaces and varying heights, which resulted in challenges during the installation process, such as an irregular projection light path and occlusion. However, the Wincomn team overcame these issues with the Christie D20WU-HS projectors through simulation using an accurate three-dimensional model. The team managed to attain vivid visuals by utilizing the depth of field processing capability of the HS Series projectors, while enabling the contents to be displayed in their entirety in a continuous and attractive manner. In addition, there were very high expectations on the color reproduction and image quality of the projected visuals due to the huge projection canvas. The extensive use of reds for the show’s contents also brought about challenges in color calibration. The results saw the D20WU-HS projectors delivering bright, accurate, and realistic colors during the projection segment of the multimedia show, which drew audiences further into the story. Through the comprehensive application of other audiovisual elements, the show had a surreal quality filled with awe-inspiring effects, providing the audience with a fantastic visual experience.